Arnold Snyder, one of the 7 initial members of the Blackjack Hall of Fame, is famous not only for his works on the topic of blackjack, though blackjack was his main card game to play and study. Snyder had written seven books about blackjack where he described concepts, tips, strategies and card counting systems of this game. These books have changed the history of blackjack forever: The Big Book of Blackjack, for example, can be considered as a hand book of every blackjack player now who wants to become a professional one and understand the concept of blackjack. The information can be found, that Arnold Snyder is the author of 9 books. Well, if 7 ones are about blackjack, then what are the two others about? Snyder had written his two books about another famous and widespread card game – poker. His two books, The Poker Tournament Formula and The Poker Tournament Formula-2 show the readers how to feel confident at the poker table during tournaments, what strategy to use in order not to be dependent on cards dealt and how to increase your chances to win. Let’s look at these two books closer. Published in 2006, this book tells you how to improve your poker skills with every tournament you take part in. Everyone can get acquainted with strategies which are better to use playing poker as a tournament in order to win much money for sure. This book will also tell you what strategies to use when you play fast multi-table tournaments which pass quicker than usual ones you got used to watch at television; maybe it sounds strange, but a player should use another strategy for such poker tournaments. This book will teach you how to recognize a cheater both at live and online poker; it will also give you full analysis of all strategies for playing this card game. Published in 2008, this book had become one of the most popular and controversial books which described everything about different poker tournaments that was missed in The Poker Tournament Formula. 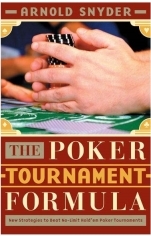 The book includes the information about strategies, tournament phases, tools of poker tournaments; but if to compare it with the first book, this one describes the secrets of winning tournaments with blind levels: such levels last up to 2 hours (if to play online poker tournament, such levels last 20 minutes and more). Well, as we can see, these two books of Arnold Snyder are devoted not to long poker tournaments but fast ones which can be observed and played both online and in live casinos every week. The author pays attention to the details other poker specialists did not described in their books; Snyder notices all small details which are nevertheless very important if you want to become a winner. You can read about other books of Arnold Snyder here.